Musical ear is unique not only by the fact that unlike the simple hearing is the result of the work of thinking and memory. He, moreover, represents a set of faces and subspecies, of which the most important are absolute, relative and internal musical ear. But few know that it also includes eight more categories. When talking about the development of musical hearing, is important for composers, musicians and singers, for some reason I think that we are talking about absolute hearing. But it is not. Because the absolute ear for music is a perfect memory of the man on the pitch and timbre of the sounds heard. A person with this type of rumor has it by nature. For him to hear the notes – it's like that anyone else hear the alphabet. As practice shows, the presence of an absolute hearing does not guarantee good music education and predisposition to career musician. And sometimes even injurious, since a person with such talent, relaxes and forgets about the evolution of relative musical ear. this type of hearing is so important to musicians and vocalists. He, unlike perfect pitch, is manifested not as a feature of human memory, but as a special mindset that develops over time and which have a greater or lesser extent, all professional musicians. the Relative or interval ear for music allows you to hear the piece or part of a sound relationship, not just a note and define them. The only disadvantage to this type of hearing is precisely its relativity, which is expressed only in approximate determination of the heard sound and the height of its sound. in addition, many of them often are and independent talent. For example, a person who has never studied music, but who by nature are gifted with a rhythmic ear, can easily reproduce the heard rhythm. These types of musical hearing between have in common is that they often need for a focused musical activities. So, the ability to hear and determine the polyphony and rhythm is very helpful to composers. 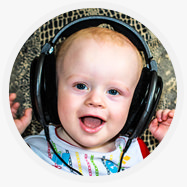 Although in General musical practice all these faces hearing also bring many benefits. See briefly on a sheet of paper, covered with notes and hum "seen" the music can anyone who has developed a talent for music and is familiar with the sound of music. However, the ability of the inner musical hearing is based not only on memory but also on the imagination. It is thanks to the imagination of the musician can "hear" new passages, to see how will sound the same melody, but played in a different rhythm or a different tool, not resorting to playing tunes live. the developed internal musical ear has enabled many composers to go down in history.